File contains ratification instrument as well as letter of transmission from 15-03-1979. Original instrument signed Director-General Matsura, UNESCO, and by Said Makthdoum Raheen, Minister of Information and Culture. 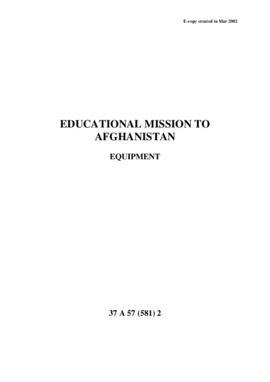 Subsubseries contains FIT agreements for Afghanistan as a recipient country. UNESCO/Italy Funds-in-Trust Cooperation - Plan of Operation for the project on "The Museums of Ghazni"
UNESCO/Italy Funds-in-Trust Cooperation - Plan of Operation for the project on "Organization of a 2-day Tripartite Seminar on the Cultural Activities in Afghanistan"
Agreement between Sweden and UNESCO on support to UNESCO's Project on Inclusive Education "Afghanistan towards Inclusive Education"
File consists of Note from Embassy describing grant and an instrument of full powers for signature. File consists of signed Plan of Operation with Agreed Minutes in annex. It also has the Memorandum from BSP/CFS on the transfer of instruments to the Archives. File includes plan of operations with Agreed Minutes in annex, Instrument of full powers for signature, and memorandum of transfer to Archives from BSP/CFS. 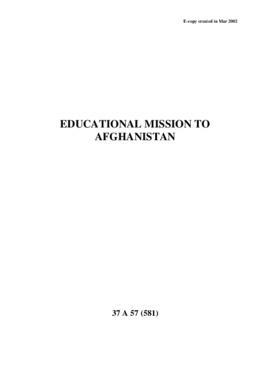 Agreement between UNESCO and the Ministry of Foreign Affairs of Finland in support of the programme entitled "Programme for Enhancing Literacy in Afghanistan (ELA3)"